Diamondback Announcers did not hold back on their opinion of Manny Machado and his controversial play in San Diego versus the Padres, Tuesday, April 2, 2019. “It’s such an unnecessary thing, to say the least” Brenly said. “Obviously, it could create a potential injury. You drop a bat next to a guy who’s looking up in the air trying to track a popup. It didn’t take long for Manny Machado to be the center of controversy concerning a baseball rule. Machado was ruled out for batter-runner interference when the Padres hosted the D’backs on April 2. 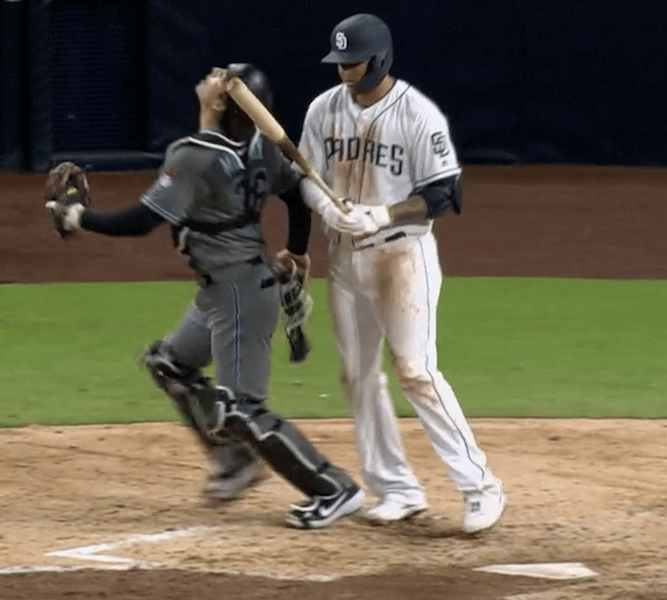 The call, that was made by plate umpire Bill Welke, led to the banishment of Padres’ skipper Andy Green. Machado, facing Zack Greinke in the sixth inning, hit a 2-2 foul pop-up along the first base line. In exiting the batter’s box, he and Padres’ catcher John Ryan Murphy briefly came together. It appeared their feet made incidental contact. Welke ruled batter-runner interference on Machado and called him out for impeding Murphy who dropped the ball in foul territory. Offensive interference is “an act by the team at bat which interferes with, obstructs, impedes, hinders or confuses any fielder attempting to make a play.” The language of the rule gives the umpire a wide latitude in calling interference. This is pure umpire judgment and it cannot be protested, nor can interference calls be reviewed. Contact is not a prerequisite for interference to be called. Intent is not a factor. Interference can be intentional or accidental. When a batter makes contact with the ball, he is no longer a batter, he is a batter-runner. The protections normally afforded to a batter in the batter’s box vanish the moment the batter makes contact. The batter-runner must be alert and avoid a defensive player who is in the act of making a play. As Machado began to run up the line, he dropped his bat in the vicinity of Murphy’s feet. That didn’t appear to have an effect on Murphy, and it’s doubtful the D-backs’ catcher even noticed. Welke noted that his ruling wasn’t related to that aspect of the play. Welke ruled that Machado impeded Murphy as he was attempting to field the pop fly. If Murphy tripped over Machado’s bat, the umpire would have to judge intent which doesn’t appear to be the case here. As I said in my spring training presentation, the batter, who hits a pop fly in the vicinity of the catcher, often tracks the ball while ignoring the position of the catcher. The batter must realize that the catcher has the RIGHT OF WAY. The batter’s responsibility is to LOCATE and AVOID the catcher. Was it a good call? That’s a good question. From what I can determine on video, Machado’s actions did not rise to the level of interference. But I was not on the field and did not “feel” the play. Players, coaches and broadcasters need to understand that any action by a runner that “impedes,” “hinders,” “confuses,” and “obstructs,” allows the umpire to invoke the interference rule. A player, who is well educated in the RIGHT OF WAY laws of baseball, would not place the umpire in the position to make the interference call.